Country people are creative...you may not think so until you realize that they learn to make do with what they have. Pioneer women worked hard to use what the homestead offered and make it "homey." I do like to make things and I have decided to create a new section on my blog for Ranch Crafts! This is my first post for that section--not my first craft project--but the first time I'm willing to share it in public. I made this as a donation to a scholarship auction. 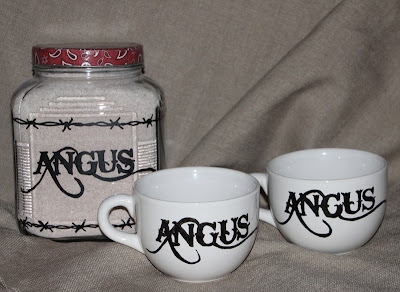 First, I used my printer to make a template of the word "Angus." This is 72 pt, Bleeding Cowboy font. To make the glass canister, I taped the template on the inside of the glass, allowing me to trace it with the glass paint pen on the outside. Easy peasy! Next, I enlarged a jpg I had of barbed wire to be the right size and printed it out, then taped it on the inside of the glass canister to trace it in the same way. After allowing the paint to dry, it looks great! I had some scrapbook paper with the pattern of a red bandanna, so I decoupaged it onto the lid. I do think that the regular metal lid looked good, too, but I wanted to add some color into the project. To make the mugs, I got some plain white ceramic mugs that I liked, and a ceramic paint pen--the kind that you paint it, let it dry and then bake it on. The mugs are then dishwasher safe, but I probably would be too chicken to do that for the first few uses! Anyway, I used the same template, and then traced it onto the mug with transfer paper. The ceramic paint pen is very easy to use and I had no problem working with it. I let it dry for about a day, and then fired up my oven to 300 degrees...with the mugs in it so they warmed up at the same time....and baked them for 20 minutes. After letting them cool, I handwashed them so they are ready to use! I filled the canister with my homemade hot chocolate mix (recipe below) and now all we need at the last minute are the homemade marshmallows from my friend! Mix ingredients thoroughly and store in an airtight container. To make a delicious cup of hot chocolate, fill your mug 1/3 full with mix and add hot water. Top with a homemade marshmallow for melty, gooey, goodness! I have been told that you can substitute flavored instant creamer -- french vanilla or even kahlua flavored would be awesome. Also, in a pinch, I totally left out the creamer. It makes a decent cup of hot chocolate and it is certainly lower in fat, but the creamer really really REALLY makes it better! Just believe me. Don't waste a whole batch without creamer! So impressed with your mugs!